I have to say, when I dip my meat into someone’s chocolate pot, I don’t expect it to be quite so boiling hot. Regardless, last night was an evening of fondue dippings, monkey calls, “amare’o” liqueur, dances in the Feste Haus and Castle Garden Departures in the rain. So here I am. Atop the highest windowsill of the highest room in one of the highest houses in Heidelberg, feeling on top of the world. This year has proven so many things, but today is that a goodbye is one of the greatest treasures we have, because leaving people you will miss is a golden gift above living around those you’ll forget. I had planned to write a novel this year, and I promise, much like my oncoming six pack, this will definitely happen without delay… But have instead traded the written words for breakthrough memories. This year, I have failed to do many of the things I thought I would, and yet have done so much more than I ever thought I could. The car is ready and the route is set, for once I think I might actually have a schedule to this day. Nice to make a change once in a while. Throughout this year, whenever I’ve left or gone somewhere, I’ve ended the blog post with something German, because I am that cool. A casual Tschüs here, an Auf Wiedersehen there, but today I want to say it in my own terms. 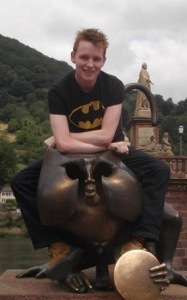 Goodbye Heidelberg, and yeah, thanks.